I've been busy with family related things so haven't managed to get much hobby related stuff done. As for month 1 of my project, the razorwing has moved on a little since last week, but not significantly enough to call it finished or to show you a picture. The good lady wife is going out with friends tomorrow night though for food and a few drinks to natter over how awful their in-laws have been over Christmas so I'm hoping to get it finished then. I have made some substantial progress elsewhere though. so no posts at all last week (thanks Papa Nurgle!). 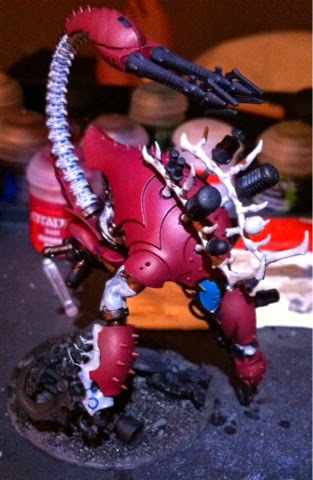 Hopefully on the mend now so today here's an update on month 1's painting progress for the Blogwars 9 project. Morning all, welcome to the second of my in depth reviews, this one looking at the options and tactics for the Talos heavy support choice. I'll also look at the role of the talos in the formations detailed in the coven supplement, namely the dark artisan and corpsethief claw formations. 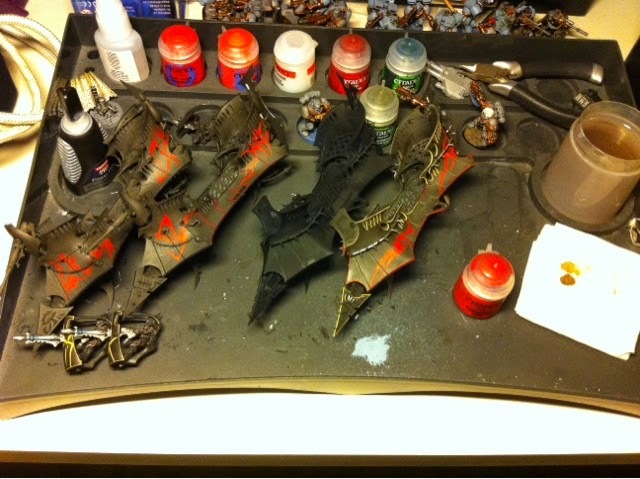 Razorwing, Archon and Raider painting progress - Blogwars 9 project! So first up, here's my Archon, Ylos Dalur, (Background fluff). 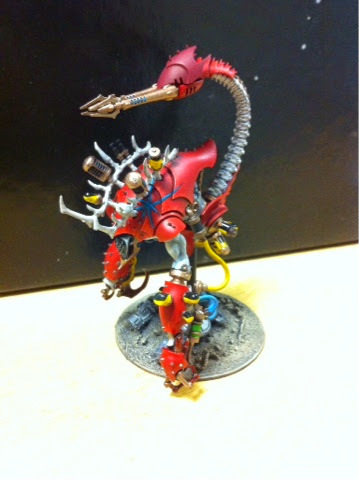 He's pretty much finished barring a couple of highlights and the biggest puzzle at the moment - the helmet on the base! I want the helmet to be that of a Chaos Marine but it needs to be striking enough to set off the armour and paint job for the archon, I don't want it to just blend into the background. Ordinarily I'd simply paint it in the colours of one of the relevant armies used at my club, but in this case the only chaos armies I tend to face that are painted are black legion (not exactly the most visual of colour schemes) and night lords (and I'm not convinced their particular brand of blue would work too well). At the moment, I'm thinking that an original Sons of Horus (Dark turquoise/green) colour scheme would look pretty sweet, without going too far over the edge of being bright or clashing with the rest of the model - what do you reckon? 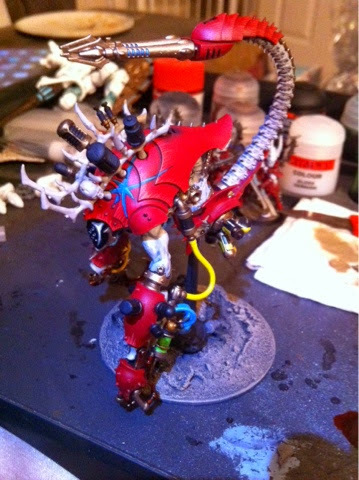 So to follow on from that then, I've made a bit more progress on the Razorwing since I last posted pictures. This is mainly in the realm of gems and metallics, but here's the current state of progress. 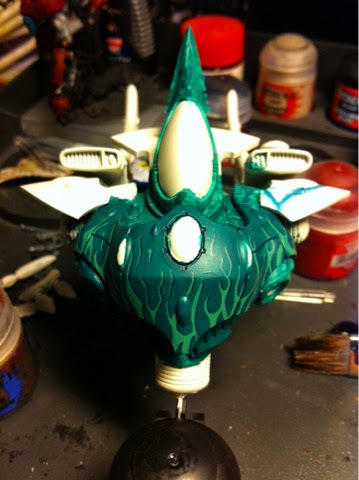 The metallic areas are pretty much done and finished, with just a few gems to do and power glows to highlight. The gems are about halfway done, I've done two layers but will be adding a third highlight just as soon as the paint arrives, and the white glint to the rear of the gems needs adding also. The main area of work on this models left to do is the scrollwork around the armour panel joins - I finished the raider on Saturday night but couldn't then face doing all of the razorwing in the same session! Speaking of which, here's the model closest to completion from this month's list - the Raider. The blend on the sail is done using drybrush techniques (I still can't get my head around wet blending for some reason - an enduring frustration of mine - I guess one day I'll have to bite the bullet and pay someone to teach me!) whilst the other elements are all layered more traditionally. I'll post up a tutorial on the colour scheme next month when I get round to painting my first warrior squad and second raider, but for now let's just say it looks more complicated than it is! I'm really pleased in particular with how the scrollwork and web design go together - when I envisaged it in my head I was a little concerned that the model would look too 'busy' with essentially two feature patterns on it, but I think the colour used for the scrollwork (which is also the same colour I've used to drybrush the whole of the model) is subtle enough not to clash, whilst the web design has enough depth of colour to it that it is clearly visible but doesn't dominate the model. So what do you all think, worth the change? I'm pleased so far but as ever I'm always happy to hear suggestions as to how I can improve things. Morning all, hope you're all feeling better than me today! In the background of that picture I'm sure you've also noticed the Archon I'm working on - there's a bigger picture to follow. I didn't want the armour of the archon to be the same colour exactly as the razorwing, but rather than go deeper I decided that actually pale armour on the warriors and archon would look pretty cool. Keeping the 'cool' theme, but still wanting to include a spot colour to draw the eye from the fairly neutral purple, I decided to go with a vivid blue. I really like the contrast this gives the purple and it also gives a nice spot colour. Next step therefore was to figure out the metallics to use. I didn't want to use a pure silver, seems a little dull for the ultimate race of indulgents, so I'm planning on using a brass effect instead, the picture below only shows the base colour though, the final finish will be toned down quite significantly. So that's it for now, hopefully I'll have plenty more done for next time! Hi all, hope you're all doing well! So what do I have for you today? Simple really - the start of a 'new' project! When I started playing 40k again back in 2012 some of the guys at my gaming club were keen for me to go along to some tournaments with them. I'm finally getting on board with that, and I've targeted blogwars 9 in June next year as the date for me to enter competition play. 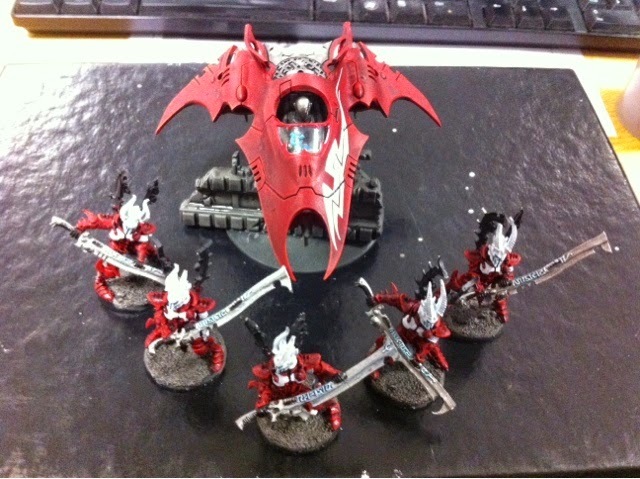 There's one problem though, I want to use my dark eldar. Which are currently sprayed black. Blogwars is an 1850pt tournament, so in order to get everything done I'll need to average 310pts painted per month between now and next June if I'm to have everything finished. That, for me, is a massive target, because I don't like skimping on painting things properly just to get them finished. My planned army list has a lot of raider chassis in it, so I'm really going to need to speed on with those, but I also don't want to get fed up of painting them, so I'm going to spread them across the months. I need a detailed plan! As you can see, I've weighted everything towards the earlier part of the project period, leaving me (hopefully) less to do in the month before the competition. There's two very good reasons for this. First, I don't expect to complete all of this on schedule every month, and second, I do t want to leave myself rushing in the last week to finish if I can avoid it. You'll also notice that I've separated the units out so I'm never painting more than 10 infantry models in a particular month - that's again a very deliberate plan because I think all the highlighting on infantry models takes substantially longer than painting tanks. So here's hoping everything goes according to plan, and hopefully I'll have progress to show you on the razorwing on Monday! Finished incubi, and talos almost done. Hi all I'm a day behind on my posts this week, so here's the painting update! 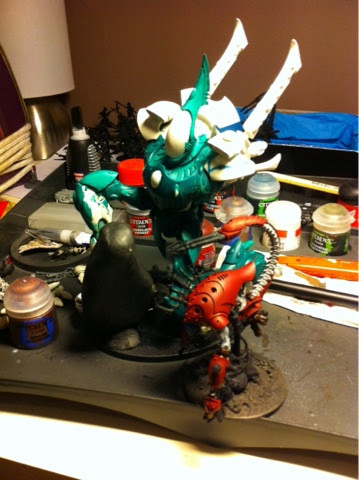 I've been working on my dark eldar recently as you may recall, but last week I had a bit of a nightmare. In varnishing the finished warrior squad and ravager, the varnish frosted as it dried (my fault, I shouldn't have left it in the cold garage to dry overnight). So almost all of my collection is now black undercoated once more, and I'll be posting up some pics of my new colour scheme soon, once I've got some new paints for it! As you can see above though, the Incubi are finished and will be staying that colour (their armour is shrine-specific so they're not going to be in the same colours as the kabalite force). Another force that's staying in their current colours is the coven units, and the first talos is almost finished, another hour or two will see it completed. 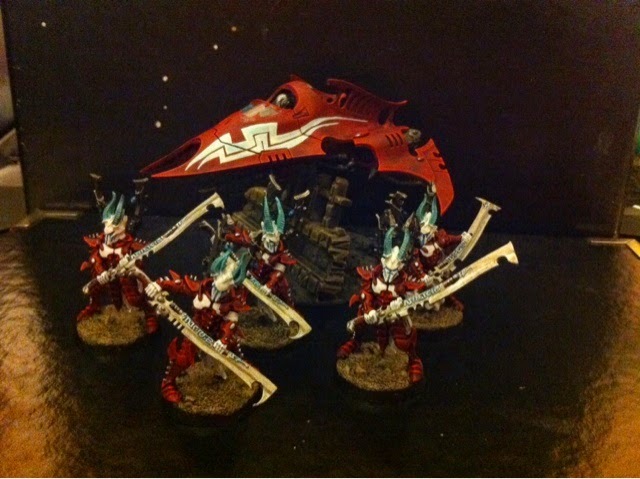 Hi everyone, I realise my Dark Eldar review series has stalled a little, but I fully intend to complete things. In the meantime, I’ve been involved in some lengthy discussions recently regarding kabalite warriors, in particular, what are the ‘best’ builds, which transport is better and what upgrades, if any, should you take on the vehicles. Hi all! So a week on from my last update, and this week I've managed to resist the temptation of getting work done on the wraithknight, focusing instead on the Talos I'm working on for a club painting competition. For the competition, I'm painting it up with the ichor injector and haywire blasters, as those will be my go-to load out for most games. I've been working on ideas for the background of my Coven units too, and as such this talos will be called 'The Agony' with a view to calling the cronos in a dark artisan formation 'The Ecstasy'. 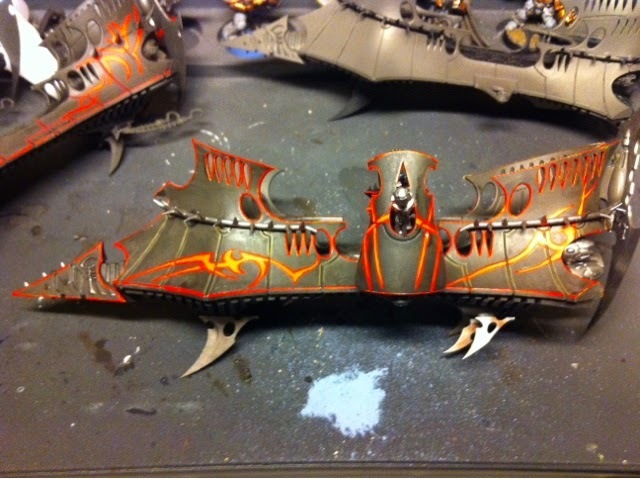 My haemonculus is also going to be specialising in torture and improvement of tyranid bioforms, so I've painted the armour plates to mimic the common style of detailing chitin - it's quite subtle but I think it works well. My only concern so far is that the fluid pipes are quite bright, but I was pleased with the idea that the vials injecting stimulants contain a yellow fluid, which mixes with the blue bodily fluids (The Agony also uses Tau genetic material) to create a green reservoir for the ichor injector. 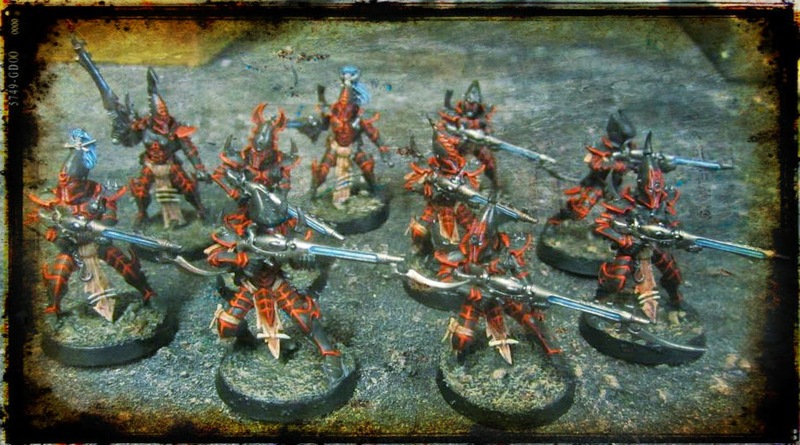 Hi all, just thought I'd post up a few thoughts on how my dark eldar force is evolving as games go by. Until now I've tended to play 1500pt games though I may look to shift that to 1850 in the near future. So I know that one game doesn’t invalidate a list, but it became clear to me having played against guard (who brought 6 tanks and 2 flyers) that I was a bit short on anti-tank fire early in the game. At most, I could bring 6 lances and 6 haywire blasters on turn 1 (heat lances will always be out of half range so I’m not counting them) and whilst that might be enough to deal with a couple of tanks/transports, anything more and I’d have a problem. My biggest disappointment with the list is the lack of impact the reavers had on the game, despite their potential. It was clear (and has been through my practice games too) that they are being targeted by my opponents, and whilst it’s equally apparent that something must be targeted on turn 1, the reavers are entirely too fragile, even with a 3+ jink save, to start on the board. With that in mind, they seemed the obvious thing to go from my list, along with the webway portal from the Succubus’ unit. The reason for dropping this was twofold – first as an assault unit, the grotesques don’t need the webway portal to be in an exact position when they arrive, since they can’t assault that turn anyway. Secondly, having dropped the reavers I was left with a few odd points that I couldn’t find a significant use for after my additions, and losing it allowed me to be a bit more consistent with upgrades (I hate taking upgrades on one vehicle of two that have the same purpose). In terms of additions then, my first go-to was a second ravager – it would increase my turn 1 board presence (and invulnerability to S4 fire on turn 1 – I’m looking at you wyverns!) 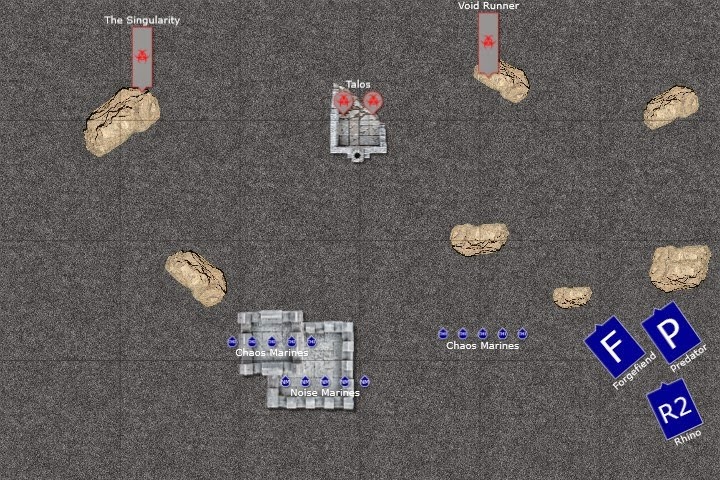 and maximise my lance output at the start of the game without compromising the tactical philosophy of dropping the gunboats in via deepstrike. I then had enough points left to add torment launchers to both warrior raiders (bit of an experiment, but not ideal in a TAC list due to ATSKNF and Fearless) and upgrade a grotesque to an aberration to ensure my Succubus wouldn’t have to take any nasty challenges. As expected, in the second game despite facing chaos marines, who would largely be affected by the torment launchers, the only unit that was a target once they arrived was a fearless unit so that, combined with the expense of 3 15pt upgrades on each of my gunboats, I decided to drop the raiders down to the basic minimum of splinter racks. That netted me 75pts to spend, which combined with the shortfall on the total in the previous list meant that I had 80 pts. Not enough to really bring a game changing unit, so I cut the aberration from the grotesque unit too (the grotesques have survived every game I’ve taken them so wasn’t worried this would leave the Succubus short on meatshields). The result looks something like this. Now I’ll admit I’m not sold completely on the second unit of scourges, so I may investigate other options for units around this points level, but it’s fair to say that the upgrades on my units are pared down to the minimum now, so 125 is all I’ll have to play with if I do change things around. Spreading the love of eldar! 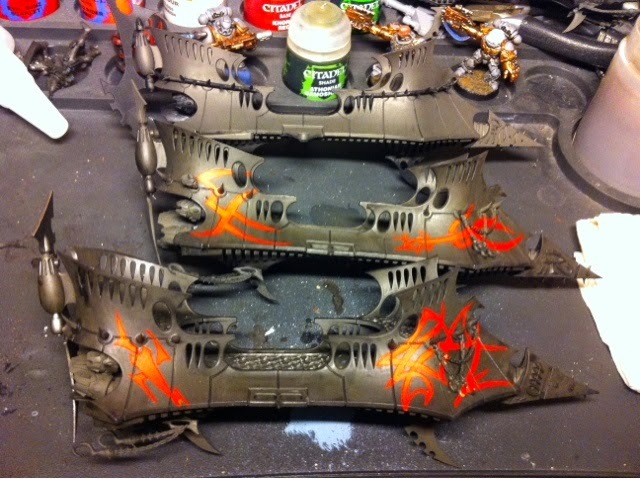 Hi all, well after my battle report last night I promised you all some painting progress pictures, and here they are! It's only base coats done so far I'm afraid, though works continues apace on the layer details! 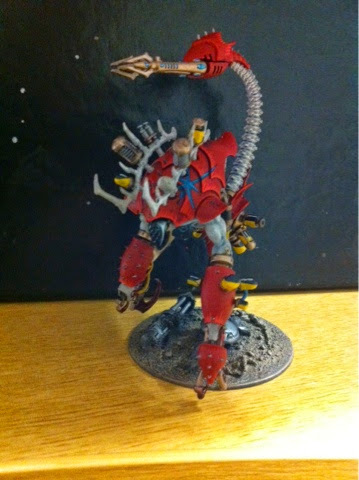 And second therefore, if the dark eldar are not your cup of tea, here's my wraithlord! This is the first model of my eldar project, 'The Revenant' and once it's done will be supplemented by a pair of wraithlords in the same style. Hi all, here's only my second ever effort using Battle Chronicler to put together a proper set of battle report maps, this one slightly better than my first attempt! So I've been a bit busy recently. All I need now is an excuse to use them on the tabletop! I have a game coming up tomorrow, my first game with a serious dark eldar list that isn't all about play testing units. It's a 1500pt game and my list is pretty general, and shooting based. I'm up against guard, including Pask in a punisher, an exterminator and four wyverns, with two vendettas. 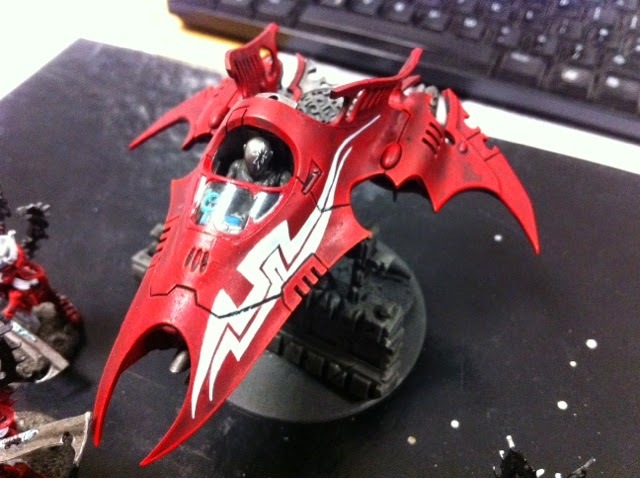 I'm taking a succubus with archite glaive, wwp and 4 grotesques in a raider, two warrior gunboats with night shields and splinter racks, 5 scourges with haywire blasters, 6 reavers with blasters and caltrops, a razorwing with lances and necrotoxin missiles, two talos with ichor injectors and haywire blasters, and a dark lance ravager. I'm also testng out using battle chronicler to do a map report, so look out for that over the weekend. Painting progress - it's been a while! so I've not posted any pics of my painting progress recently, so here goes, this could be a bumper update! So since the last time I posted painting pictures, the Dark Eldar codex has dropped, and I've been busy updating some of my models - needless to say the Iron Fists have been put on the back burner for a while. As you can see above, there's a squad of Kabalite Warriors finished. Here's their transport from both sides. The scheme is a Charadon Granite base (no longer available - stormvermin fur is now the closest you can get, but it's not that close even so) washed with Nuln Oil. 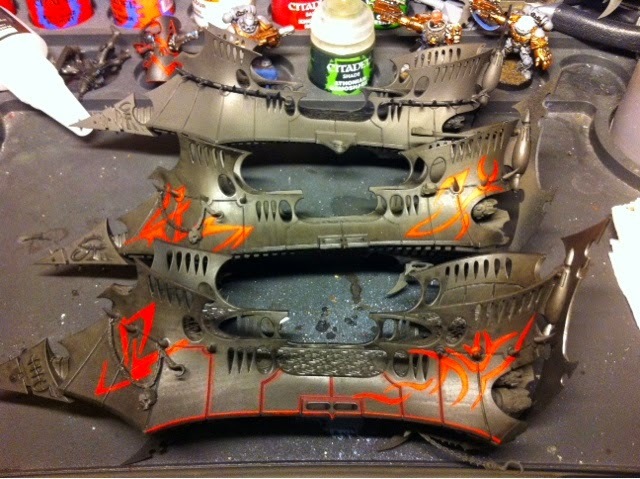 The armour plating is edged with Khorne Red, and the patterns and sail are done with a 3-coat layer of mephiston red, evil sunz scarlet and wild rider red. I've had lots of compliments about the iconography and questions over how it's done, well it's not as difficult as it looks, but it is time consuming - I did lots of sketches beforehand getting patterns I liked, then superimposed them over an outline of the raider. Once the basecoat grey and wash are done, I then pencilled the pattern onto the model before filling it in with the reds - simples! 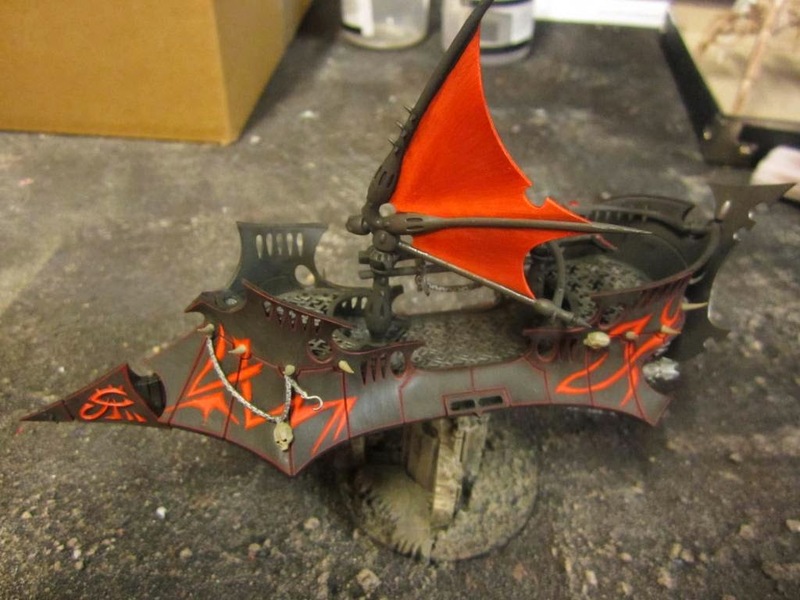 Next up, and the second part of my vow for painting stuff in October over at The Dark City forum is a ravager - the anti-tank tank of the Dark Eldar. The scheme is exactly the same as the Raider, just with different patterns. Finally, what I'm working on at the moment is the small squad of Incubi that I'll need if I ever use the Kabalite Raiding Party formation from the codex. 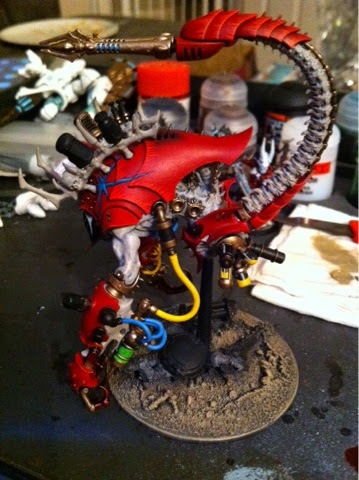 First up, here's how far I got with my old scheme. Looking at their basic profile first there are two things that really stand out. First, they are just as skilled as a space marine, but only as strong and tough as a guardsman. This is one of the defining traits of the entire codex in actual fact. 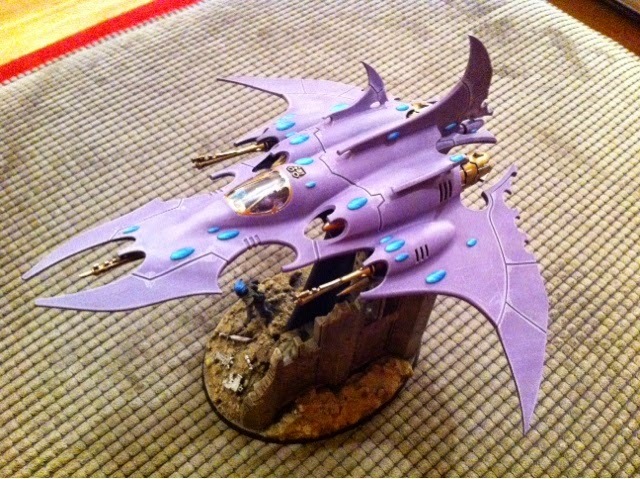 The Dark Eldar book is often described as a glass hammer or glass cannon, and this profile split shows why. Your own shooting is as powerful as anything in the game, when taking into account range, rate of fire etc. You’re almost uniquely ill-equipped to deal with the return fire however (there are more fragile troops, but none so costly in points terms). Second – they’re fast. Despite being a basic troop type they will still strike in combat before just about any other unit in the game, including many characters. This is an important factor in the above point, both for the kabalite warriors and the wyches we’ll look at later. Now you might wonder why this matters on a unit that’s clearly not intended to be a combat effective option, but consider this – in the late game, the warrior unit brings three attacks each on the charge at S4 and Initiative 5 – that’s as many attacks as an assault marine, who would strike after you provided they’re either already in combat or you don’t have to charge through cover. So in terms of options, what can we do for the warrior squad. Well the first upgrade is to make them trueborn, but as they then fall into the elite category I’ll deal with them later. Squad size begins small enough to fir in a venom, and ends at double what you can take in a raider. This gives us nice flexibility in purpose for the warrior squads, you can use minimum size squads to get access to venoms, gunboats to make use of the benefits raiders bring, or just max out the squad completely to really bring the pain down on the enemy. As with most codices, you can upgrade one of the models to a sergeant character, in this case referred to as a sybarite. In profile as is fairly standard they bring an extra point of leadership and an extra attack, along with access to funky wargear. 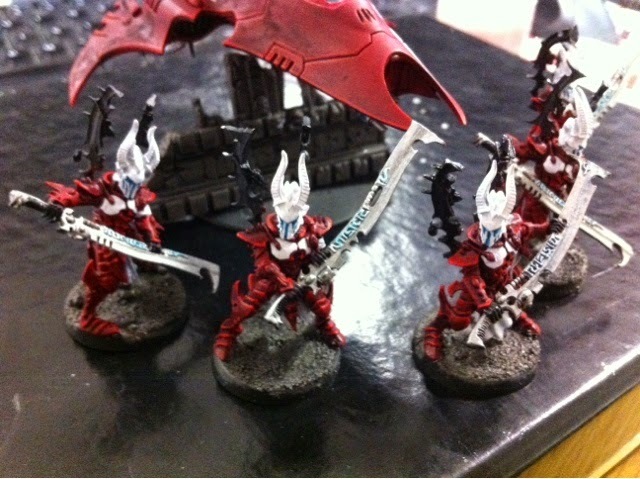 In the case of the Dark Eldar, I really don’t see the extra point of leadership to be all that important. Basic leadership is above the average roll for two dice, and there are two unique factors that combine to make this even less important. First, you’ll often be wanting to take your warriors on transports, which makes them fearless. If you’re not taking them on transports then you’ll probably be bringing them in via webway portal so they’ll be accompanied by a higher leadership character in any case. The extra attack for a sybarite can be useful, but it’s not going to make a massive difference when things get choppy choppy. So, you’ll be relying on the upgrades to make the sybarite worthwhile then, yes? Again as is fairly normal, they can swap their rifle for a pistol, giving them two melee weapons at the cost of range, though in this case, they have the choice of two different pistols, one a version of the darklight weapons scattered throughout the list. Theoretically at least it’s a good pistol, but the range is incredibly short making it functionally difficult to use, and certainly not worth the points in a general list. The two important pieces of equipment though are haywire grenades (sure, it’s only one guy in the unit but they’re cheap and they can cause some serious damage when you cluster several units together). The upgrade I’m coming to see as a bit of a gem though is the phantasm grenade launcher – it’s basically a poor man’s Psychic Shriek, though its wounds cannot be applied to Fearless or ATSKNF models. This particular type of equipment can also be taken on the raider and used in combination with a model wearing the Armour of Misery for a negative leadership modifier, has the potential to rip casualties out of the heart of the enemy army and change the game on its own (bear in mind, the leadership modifier would also apply to morale tests caused by any casualties too). Clearly it works better on units with lower leadership, and if you can catch them close to their table edge and cause them to fall back off it, all the better! On to upgrades for the unit, you can take one of two special weapons, one if the unit is minimum sized and two if you’ve maxed out the models. Here’s where I have an issue though – more so than many other armies, because the normal rifles carried by the unit are poisoned, they are completely incapable of harming tanks. As such, the weaponry in the unit is mono-tasked, and only one of the weapons that can be taken synergises with that task. Many reviews you’ll see will advise that you take as many blasters and dark lances as you can fit into your army, but that’s where I disagree – I don’t want to go into any game knowing that any of my units are going to be wasted. Taking a warrior unit with mainly anti-infantry shooting just to get access to a blaster (and possibly dark lance) seems counter productive as now the unit has two completely different targets. Sure, if you’re taking the blaster to boost your anti-infantry power (if you know you’ll be facing lots of power or terminator armour for example) then by all means, but I’d certainly advise against taking blasters for anti tank in a warrior unit (hint – that’s what trueborn are for). The other weapon option, the shredder, is mixed in terms of its effectiveness, I’d definitely say it’s mainly anti infantry, but it retains a certain amount of anti vehicle capability, at least for stripping the odd hull point, due to its high strength. The big problem with the shredder is it’s just a small blast, and any opponent who knows what they’re doing won’t let you hit more than one model at a time, in which case you’d have been better off taking the splinter rifle anyway (seriously, I do not know why they didn’t make the shredder a template weapon). For heavy weapons, they are limited to a splinter cannon or dark lance. I’ll not mention the dark lance too much since it’s just a heavy version of the blaster (with a longer range) and therefore suffers all the same issues mentioned above. The splinter cannon however is an upgrade I just can’t decide on at the moment. It’s now a salvo weapon, 4/6, so at the very basic level it adds firepower of the same type to the unit, but at the cost of range if the unit moves. That’s fine I hear you say, why not just stay still, you don’t need to move now to get your jink save, and you’d be right, but quite often I find that if you don’t move the unit, you’re limiting the amount of firepower the rest of the models can bring down, and losing 9 splinter rifle shots if your target moves out of rapid fire range to gain two more splinter cannon shots just doesn’t make any sense. 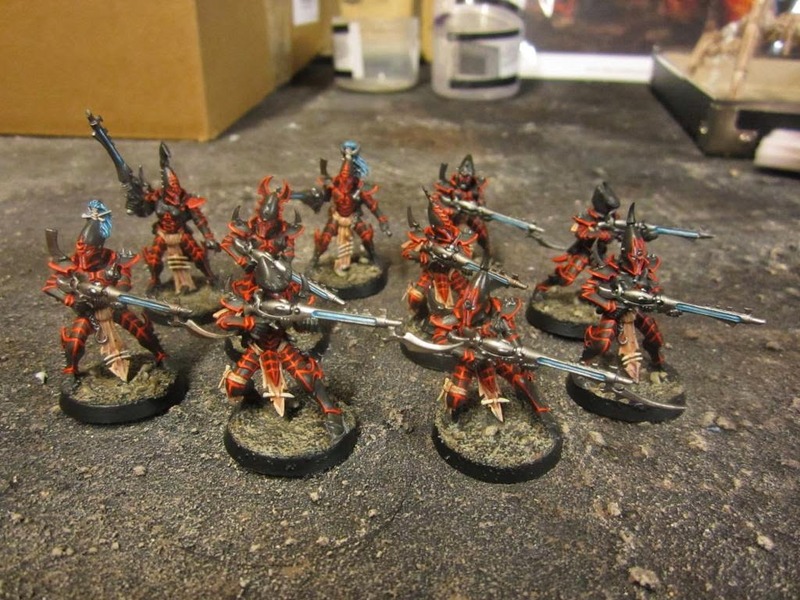 The warrior unit is a staple of a Dark Eldar list, though if it weren’t for the minimum requirement you probably wouldn’t see all that many in a list any more. As you’ll see when we come to dedicated transports I think they’re most effective taken in raiders with splinter racks but otherwise kept as cheap as possible. I honestly wouldn’t bother with the special weapon upgrades, or the heavies, they make an already costly unit even pricier, and the Dark Eldar army has much better, more efficient ways to get any of the firepower those options bring. I would strongly consider taking phantasm grenade launchers though against most armies in the game, they can come in really handy for whittling down the enemy units and forcing morale tests. Well, boy has this unit divided opinion online! I’m going to read you a quote from the book here about wyches, which is that all wyches are skilled knife fighters who can kill a foe many times their size with the smallest of blades. Now we all know that the fluff exaggerates the abilities of the models way beyond their tabletop performance, but this one probably takes the biscuit. Under the umbrella of the last codex, wyches were one of the most utilised troop types – in fact the 5 wyches with haywire grenades in a venom was seen so often in competitive lists it was one of the elements that drove me away from the army for a while. Well, the haywire grenade option has gone, and wyches are back in the fold under their fluffy purpose – combat troops. Looking at the statline for wyches we see the basic traits of the Dark Eldar coming to the fore again, the marine levels of skills, the guardsmen strength and toughness, and the ridiculously high initiative (even higher than the warriors on this occasion). Where the analysis gets complicated is that wyches bring combat drugs to the party, so one of 6 stats gets a +1 increase from the start of the game. This can be anything from making their opponents easier to hit, wound or even making the wyches even faster to the punch. There’s perhaps only 1 that I’d say is of no functional use however, and that’s the initiative bonus. In wargear terms, wyches bring assault grenades, which are rare in this book, and they also bring an invulnerable save in the fight sub phase. This again has caused consternation with a lot of players feeling they should get their invulnerable save against overwatch fire too. I can’t see how this is justified myself, since the dodge is meant to represent their speed in combat, whereas overwatch fire is on a par with shooting in your enemy’s shooting phase. The save makes them very good at hanging around and ‘tar-pitting’ the enemy (bogging a unit down in a combat it can’t get out of quickly) though I personally think it would be better representative of their purpose if they were more able to damage the enemy. Interestingly, the wych squad has a maximum size of 15, instead of 20 for the warriors. There’s the usual sergeant upgrade and similar to the warriors, the unit can be upgraded to the more elite bloodbrides (again, I’ll review them in a separate post). Interestingly the sergeants can only take weapons from the melee list not the wych cult weapons, which are limited to 1 unless the unit numbers 10 or more, in which case up to three may carry them (this means if the unit is accompanied by a character, you can only have one wych weapon if you’re going to fit into a raider). All things considered though, if you were taking the sergeant upgrade, the melee weapon options are better (well, the agoniser is, the power sword less so). Wych weapons are interesting now, giving you either re-rolls to hit, shred or re-rolls of all 1’s. They’re all pretty cheap, which is good since they only affect the unit carrying the weapon and are therefore pretty average in terms of game effect (dice never behave right, your wych with shred will miss, the razorflails will fail to wound and the shardnet will fail on 2’s instead of 1’s!). The wyches can still come with a venom or raider, and the sergeant upgrade can take haywires for a potential two haywire effects each turn. (Of course, if you also take a character with haywires, you can dismount them separately from the wyches, throw two haywire grenades from the unit and follow it up with two charges, possibly tanking overwatch on a different model to keep the wyches alive. Finally, the sergeant can also take a phantasm grenade launcher the same as the warrior equivalent. The wyches are a single purpose unit these days, and they’re not massively anti tank (though haywires on the sarg and an attached character aren’t a bad option). That’s not to say they haven’t got a place in the army though – plasma grenades mean they’re one of only two units that can charge into cover and strike at initiative, and they’re great for bulking out a combat character’s attacks. On their own they can still tie down a scary unit from your opponent’s army, particularly come turn 5 once they have fearless. Where wyches are viable however is in combination with other units – they always suffered, particularly on overwatch when charging a unit containing flamers. The presence of plasma grenades though means that they can actually make use of the high initiative they have to start with, and it’s important to remember that they will always be better than the statline from the book thanks to combat drugs. The downside to this is that whilst they work great in combination with other units, that becomes a substantial investment once you add in their transport and the other unit, whatever that may be, to take the hit on overwatch in their place. In short, yes, wyches are still usable, but I think you’ll really only see them in heavily themed combat lists. Once again, let’s look at the profile of the vehicle first, before looking at particular loadouts and strategies. First thing you notice then is that it’s fragile. It’s a fast skimmer, with armour as low as it gets, equivalent to a space marine land speeder, with an extra hull point. It comes stock with the anti-elite disintegrator cannon, and has two special rules – deep strike and night vision. So we have a fast skimmer vehicle with a single weapon, that can deep strike to deliver its payload unharmed into the heart of the enemy. Jury is still out over just what effect the deep strike rules have on skimmers with regard to scattering over enemy units (I’m personally of the opinion that the rules offer more support for the view that a skimmer that scatters in this manner on deep strike is moved to avoid the enemy unit, but I know others who strongly disagree with this view - I’ve just not seen a convincing argument for it yet). As you’d expect the transport has access to a variety of vehicle upgrades, all of which allow it to perform in certain ancillary roles or support its main role. Let’s get this straight right from the start, it’s main role is to transport infantry. The disintegrator cannon can be upgraded to a dark lance for a nominal fee, which is an anti tank weapon. Chain snares effectively turn the vehicle into a tank for tank shock purposes, enhanced aethersails allow an extended flat out move in the shooting phase, grisly trophies help your troops to pass morale tests, the shock prow allows the skimmer to ram other vehicles, night shields grant stealth, torment grenade launchers work in exactly the same way as the phantasm grenade launcher already discussed but with greater range, and splinter racks make your splinter fire more effective. As you can imagine, for a fragile vehicle such as the raider, you’re almost certainly not going to want to pile all these upgrades onto one vehicle (it would more than double its cost) so you need to carefully evaluate the primary and secondary battlefield roles it’s likely to have. If you want your raider to act as a mobile platform for your kabalite warriors to pour splinter fire into the enemy, then splinter racks are ideal. Night shields will allow those vehicles to survive far longer in the fight (without affecting the accuracy of the unit embarked on the vehicle!) and torment grenade launchers could seriously improve the likelihood of dealing a hammer blow from any unit charging off the raider that turn. These are the three upgrades that I see as supporting a primary use of the vehicle (either as a firing platform or a transport for an assault unit). For secondary roles then, the upgrades get cheaper. Grisly trophies will allow your units to hang around longer in the fight, though as you should be getting the drop on your opponent and your troops become fearless on turn 5 at the latest, I’d say it’s perhaps an upgrade I could happily forego. The shock prow is an interesting upgrade, essentially increasing the raider’s armour value for the purposes of ramming other vehicles. On the flip side, if you’re ramming tanks, you don’t have an advantage once they’re armour 12 or more (actually, anything more than 12 and you’re still more likely to hurt yourself than you are the enemy). Consequently, the shock prow is situational and predicated on you ramming the rear armour of your opponent, something they’re hardly likely to let you do without working hard to achieve it, and as such I’d say it’s best left at home (maybe on one raider per army, tops!). I’m unsold on aethersails at the moment. I’ve seen reviews from people who are very experienced gamers claiming they’re like gold and they’d never take a raider without one, however I am struggling to justify the points in an army whose transports can already move 30” per turn and are capable of arriving within a flat out move of the exact point they want to be. Finally, chain snares are an interesting topic. Similar to the shock prow, they allow your vehicle to undertake moves like a tank that other skimmers can’t execute. Great, I hear you say, how many times have you ever seen a tank shock win you a game. In fact, how many times have you ever seen someone fail the leadership test for a tank shock? I’d hazard a guess your reply will be between ‘never’ and ‘once’. Still, if you combine this effect with a passenger wearing the amour of misery, even space marines will struggle, since they would only be passing such tests on a 6! Or in other words, a less than 50% chance of passing the test! For the points involved, I’d say that one is worth it, particularly if you’re playing something like a Tau army that’s likely to have lots of units close to their board edge. The raider is not cheap – a rhino it ain’t! However, in the right circumstances and with a clear thought process in choosing upgrades, it can be a force multiplier and a deadly tool in its own right. 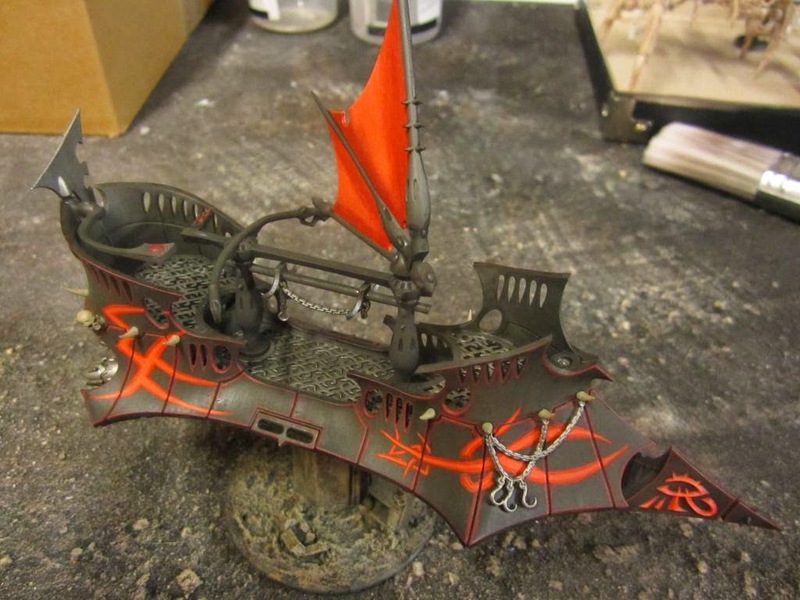 I personally would take 3-4 minimum in a dark eldar force, using at least a couple as gunboats with splinter racks (and possibly night shields if I have the points and I’m not playing an army with a lot of options to ignore cover). If I’m using a few assault units I’d probably stack up on torment launchers to complement those I would take on the assault units themselves, and I’d definitely consider upgrading my HQ’s boat to carry chain snares. At this point, I wouldn’t go for aethersails, but if you play a lot of tactical objective games (Maelstrom of War) then you might want to think about them. Well, what can you say about the venom that hasn’t already been written endless times on endless websites? You’ll see them everywhere. The venom comes with the same lack of armour displayed by the raider, but in its case it’s protected by an in-built flickerfield, which gives it a modes invulnerable save (Feel no Pain for vehicles?). It has a hull point less than the raider, but otherwise has the same special rules. By default, it’s armed with a splinter cannon and a twin linked splinter rifle (actually, the unit entry picture in the codex has it still armed with the twin rifles). The main upgrade is to swap out those rifles for a second splinter cannon. I’m gonna go on record here and say that I don’t think any of you will ever have played (or possibly ever will play) against a venom that doesn’t carry two splinter cannons. As with the raider, the venom (theoretically at least) has a solitary role to perform. Transport of a unit. Errr, no, it doesn’t quite end there. 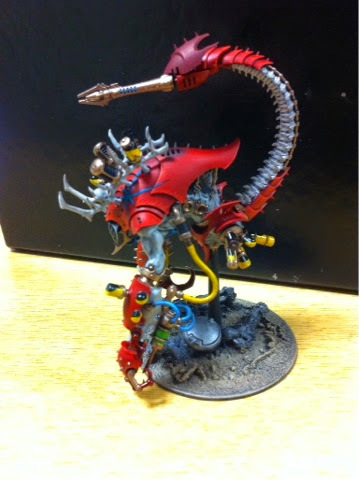 The anti infantry firepower kicked out by a venom is such that you’ll see these things spawned over and over again in many dark eldar lists – it’s a problem that’s only really got worse with the current codex, since as we’ll see later they can now be taken without a unit to transport. The transport capacity of a venom is half that of a raider, and as such the only units you’ll really see them carrying around are incubi (who don’t need to be taken in more than groups of five), blasterborn and minimum size warrior units with a blaster. The vehicle upgrade list for the venom is very limited, just the grisly trophies and chain snares. I wouldn’t bother quite frankly, the grisly trophies for the reasons set out in the raider review above, and the chain snares because if you’re going to set up a transport to perform a secondary role like that, you might as well put it on the one with the extra hull point in the hopes it’ll be able to use it. My venom review is short for one reason only – they’ve not really changed in purpose or capability since the last codex. They’ll probably outnumber raiders in peoples lists substantially, and they’ll tend to hang around at the back of the board pouring anti infantry fire into anything within range. The only real change is that now the night shields no longer reduce the range of your weapons, you’ll be able to shoot them back easier. Hi all, so I got my first game in with the new codex last night, testing out some units i didn't use in the previous version and some interesting looking combos i've been thinking about. I played against a Dark Angels force, which was also picked to test a few ideas and so wasn't 'competitive' in that sense of the word. The game went well, and I managed to table my opponent on Turn 6. Here's how things went though from turn to turn. Archon with a court (2 medusae, 4 sslyth) in a raider with night shields and splinter racks. WWP and helm of spite. Succubus with Archite Glaive, WWP and Armour of Misery. 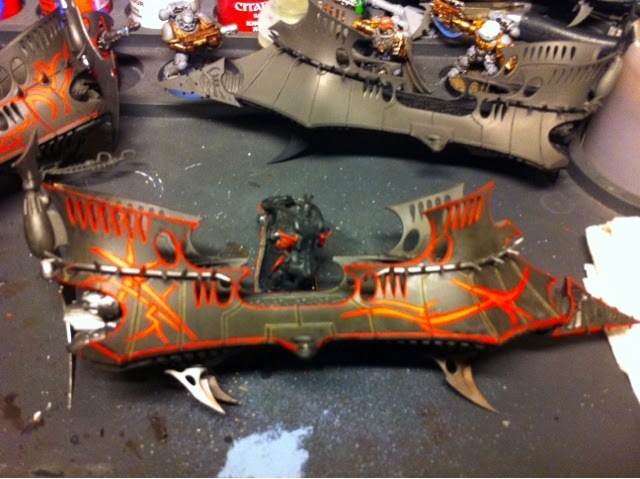 Accompanied by 4 grotesques in a raider with chain snares and disintegrator cannon. 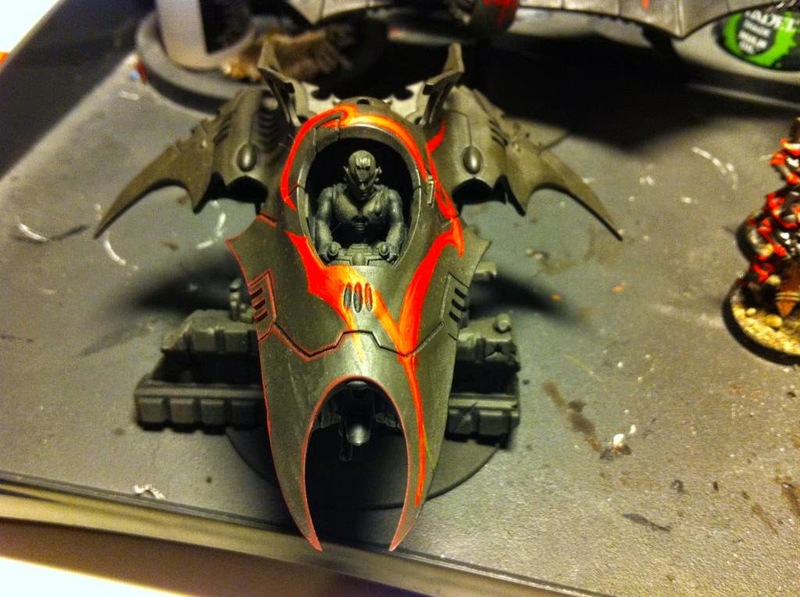 voidraven with the split missile option. Cronos fired the spirit vortex and the bikes, but failed to wound, the Mandrakes shot the bikes and killed 2, but they passed their morale test. The rest of his army (that was in range) fired on the last mandrake. Considering we're talking upwards of 40 bolter shots, he only failed about three saves, so without the flamer I'd have been really confident of keeping the unit alive. Reserves - 3 of my 6 reserved units arrived, the court, voidraven and one warrior squad. FNP 6+ for the whole army. The medusae in the court killed 3 marines, though most were saved by the librarian in the command squad, who was wearing 2+ armour (managed to get one wound through on him though, and my opponent decided to look out sir the rest rather than risk him dying). The 4 sslyth in the unit also shot at the unit, only missing once thanks to the splinter racks, but only wounded twice (yup, my dice were not rolling hot yet). The void raven arrived and aimed its bomb at Belial's squad. Sadly i managed to roll a maximum for its scatter and because they were in deep strike formation the template missed. The warrior squad arrived close enough to fire at the techmarine protecting the dreadnoughts with its power field, and managed to get enough wounds through to take him down. 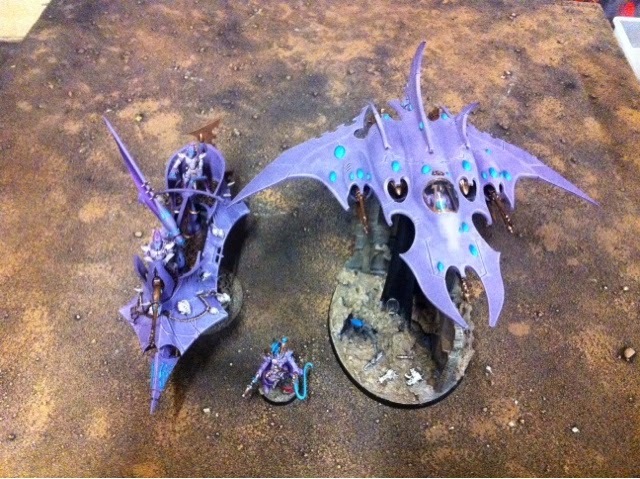 The voidraven used the opportunity to aim both its void lances at the dreadnoughts and sent one crashing to the floor. The Cronos charged the two bikes, killing one, and the talos wiped the five terminators (including a pair with storm shields) before they had a chance to strike back. In return, the librarian manifested prescience on the devastator squad, but rolled a double four on his attempt, meaning that thanks to the helm of spite worn by my archon, he'd suffered a perils of the warp attack. My opponent managed to roll a two for the result, killing himself. At this point, he decided that my archon's raider with the court were priority number one on his kill list. The seven man tactical squad fired their four shots each, managing a grand total of 1 hull point after jink saves. the devastator squad managed two penetrating hits, that were both saved, and another 36 bolter shots and 1 plasma cannon blast from the second tactical squad failed to do any damage. The command squad then charged the raider, losing the standard bearer to overwatch and the krak grenades in combat managed just another glancing hit. Belial charged the cronos, getting a single wound through its saves, though the cronos missed with its return attacks. The thunder hammer terminators accompanying Belial also caused a single wound. The remains of my reserves arrived this turn power from pain ramped up to give everyone Feel no Pain 5+. The medusae of the archon's court wiped out the remaining command squad members, and 5 of the nearby tactical squad. the voidraven fired at the first tactical squad (already down to 7 men) with all four missiles, killing two with the shatterfields and another three with a single implosion missile (the first missed). My second warrior squad wiped out the remaining 5-man tactical squad thanks to short range twin linked splinter rifle fire, the disintegrator raider killed one of the now 2-man tactical squad, the final member surviving thanks to going to ground. Belial killed the Cronos in my assault phase, and the Talos charged in killing one terminator in return (couldn't believe it, i had ten attacks, and missed with 8 of them). The succubus and grotesques charged the devastator squad, the succubus killed everyone before the grotesques got a chance to show what they could do. 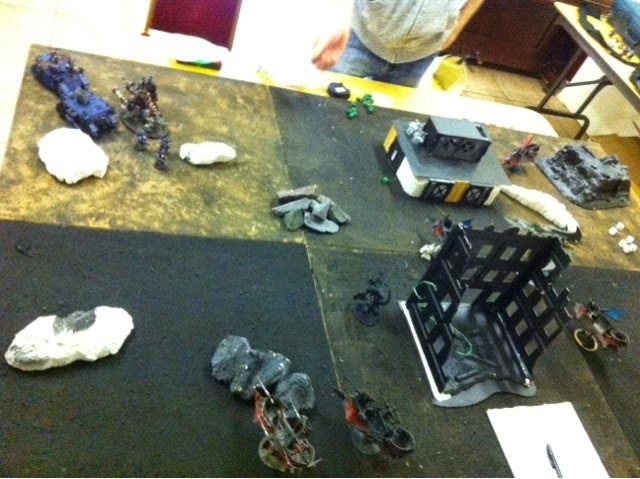 Not much else happened, my opponent had Belial and a few terminators, and a single dreadnought left. In the remaining turns we saw just exactly what the new power from pain does for the Dark Eldar. I managed to to kill all of Belial's bodyguards and took him down to a single wound. The scourges took down the last dreadnought, but got charged by Belial in return. He only managed to kill 1 thanks to Feel no Pain, and because they were fearless they stayed around. in my next turn (when i now had furious charge and rage) I charged him with a squad of warriors. 30 S4 attacks later Belial went down under a hail of blows, failing four saves, and I'd tabled my opponent. First off, it's safe to say that the glass hammer definitely works as a hammer when you coordinate things. the archon's court and a warrior raider caused serious damage when backed up by some missiles and supporting fire from raiders. The medusae proved themselves invaluable, taking down more than a whole tactical squad's worth of marines on their own in just two turns - the sslyth backing them up really make the squad difficult to take down too. Night shields are great against weapons that don't ignore cover. I couldn't believe just how many shots the archon's raider absorbed in my second turn. The Succubus just loves killing stuff. She made such light work of a combat squad of marines on her own that i didn't get the opportunity to see what the grotesques could do. Furious charge made this really work well, and in some ways i was glad that she didn't arrive until turn three. The Helm of Spite is, erm, hilarious. In terms of wargear I was mainly looking forward to seeing the armour of misery at work, but the helm was great, meaning that even rolling two dice to cast has a decent chance to worry psykers. Adamantium will would just be a bonus really. The Talos/Cronos combination is great, but you still need to be careful with them. Can't think of too many models that have both fleshbane and AP3, but it was deadly here, particularly since he was able to pick on the Cronos first to rid the Talos of their boosted FNP. Reserve manipulation isn't key at this points level. I had 6 units in reserve at the start of the game, and though I went first, i rolled below average for them arriving - it was still enough to bring good firepower to bear. Ironically i think re-rolling for your reserves is more important at lower points levels, since they will make up a greater percentage of your firepower. Next game I'm going to use a few different units to see how they perform, I'd like to use ravagers, razorwings and Incubi at least, though I'm going to keep the warrior units in there. 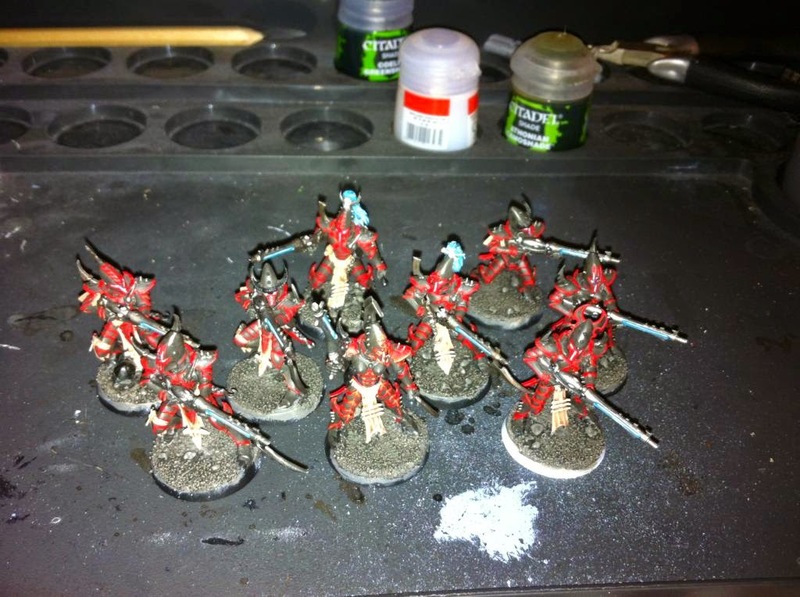 Welcome all to my in-depth Dark Eldar codex review. Some of you may have seen my previous synergy reviews of the old codex - this multi-part review will incorporate synergistic elements but I hope will give you a bit more insight into the build of the units and how they work best within the army as a whole. As always, this is my opinion, and it's influenced by my own experience collecting, painting and gaming over the last 20 or so years. There are three generic choices in this section, and three special characters. The first thing that immediately hits the eye is that there are special character versions of the Succubus and Haemonculus, but the third special character is not a specialisation of the Archon, he’s the Incubi special character. Let’s have a look at the three generics first then, starting with the Archon. For an HQ unit of this nature, the first thing you notice is he’s cheap. 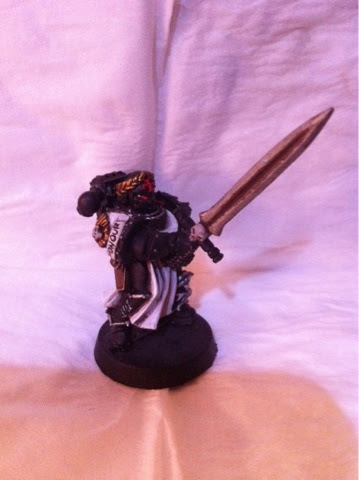 Not far off half the cost of the basic space marine captain, in fact. For that, you get a min-maxed statline. A ballistic skill high enough to give him re-rolls when he misses and a weapon skill to match, making even a space marine chapter master blush. His Initiative is high enough to see him strike first against the majority of characters in the game, and his attacks and wounds are everything you would expect from a character at this level. Leadership is perfect, in fact, the only area that lets the Archon down is the characteristic strength and toughness of the Eldar. Unusually for ‘main’ HQ units of my experience (Tau excepted!) the Archon actually has a viable option for ranged offence. He comes stock with a pistol and close combat weapon that can be switched out for the husk blade, which is basically a power sword with the instant death rule. He can also however take a blaster, meaning that he can actually make use of that high ballistic skill. He also has a pistol option, and can take a host of various wargear and items that have the potential to make him very expensive indeed. Let’s look at a few of those options then, specifically those that are unique to the Archon or key reasons why you’d use one. The classic accompaniment to the husk blade is the soul trap – the current incarnation is far more useful than before, and lets you boost the strength of the Archon based on the number of wounds caused in challenges – it’s certainly useful if you’re kitting out your Archon for combat but I don’t consider the Archon to be that kind of character anyway. Added to that, its usefulness is limited to killing things in a challenge and a canny opponent would simply refuse to give you the opportunity to use it (unless they play Chaos of course). The Webway portal, previously almost exclusively the preserve of the cheap haemonculus due to the semi-suicidal tactics required to place it in a useful position. I personally think that in this codex, the webway portal is key to one of the methods of using the Dark Eldar to their potential. It allows the Archon to fix the exact position of his unit when it deep strikes, and any transport that unit may be embarked upon. Finally I’m going to mention the Shadowfield. It’s a 2+ invulnerable save, perhaps making the Archon one of the most survivable units in the game without being buffed from outside, though it does have a major downside, in that if you fail a save, it shorts out and can’t be used again. Given its cost, it can either prove to be the biggest bargain in the game, or the most expensive waste of wargear out there. Interestingly, once the Dark Eldar start getting Feel no Pain, the way the rules are worded if you fail your shadowfield save but pass the Feel no Pain roll, the shadowfield doesn’t short out. 1. An extra blaster shot for anti-tank options. Next up is the Succubus, the leader of the Wych Cults. More expensive than the Archon, the Succubus makes even that highly skilled fighter look slow and talentless. Her ballistic skill is lower than the archon, but you still get a re-roll if she misses, and her WS and I values are incredible. You can pretty much guarantee that if this girl breaks a units she’s in combat with, they’re going to be caught. As with all wych type models, she comes stock with an invulnerable save against close combat attacks, making her considerably safer in combat than she is out of it. Combat drugs are also a standard item, meaning one of those high stats is going to be even higher, though it’s a random one each game. Her basic wargear is nothing to shout about, and although she can take wych weapons, those aren’t going to cut it against the best combat characters in the game. She can however take a glaive weapon, which can be wielded in one of two ways, giving her either the option of an extra attack or higher strength and lower AP. Depending on the timing of any charge therefore, and the combat drugs rolled, she’s capable of hitting at S6, or mustering a mighty 8 attacks. The only thing that lets the Succubus down from being a real combat specialist is her toughness, because her invulnerable save isn’t good enough to tank too many wounds on her behalf. Looking at a few of her options we’ve not already seen (she can also take the webway portal), the djinn blade increases her attacks at the cost of a potential wound, and it doesn’t come with AP2, but against everything else she becomes a whirlwind, charging with 10 attacks on turns 6 & 7. Alternatively, you can give her the armour of misery, which is armour proof against bolters with an inbuilt invulnerable save that also gives her the Fear rule and reduces the leadership of nearby enemy units. Finally, the parasite’s kiss is an interesting, cheap, poison pistol option that has the potential to boost her wounds back up for each kill it achieves. The Succubus is the combat HQ option from the codex, no doubt about that, and paired with the right unit, they’d be capable of bringing a truly terrifying number of attacks to bear. I do feel that she’s ultimately too fragile to be your sole HQ choice though, particularly given her lack of a decent saving throw outside of combat, but if you’re playing games at a points level sufficient to take an extra model, she’ll do you proud. As for use, again the fragility inherent in the army would suggest I’d avoid exposing her to the enemy too early. Keep her either off the table or on a transport out of sight until at least turn three though and with furious charge, and the benefit of feel no pain, then combined with her invulnerable save and her extremely high weapon skill, she actually becomes pretty survivable to anything less than Strength 6. She’s one of the units where you wouldn’t be unhappy to see her gain the +WS options from either combat drugs or warlord traits, since that takes her weapon skill above the crucial number so marines etc are only hitting her on 5’s. Ironically, I actually think the Succubus works best leading a unit of Grotesques into combat. Her high leadership mitigates their low value whilst their high number of high strength attacks really backs up her combat punch, which is lacking from wyches and bloodbrides. Finally then for this post (I’ll deal with Special Characters later) we look at the Haemonculus. This guy is the ‘buffer’ of the HQ section. Slightly cheaper than the Succubus but more than the archon he can also take the webway portal (see what I mean about it being key to the army?) He has a negligible save to begin with, but starts with Feel no Pain. You might think therefore that this invalidates the power from pain rule for the first three turns, but he also comes with a nice little rules addition, which is that he and his unit add +1 to the turn number for the purposes of determining the power from pain benefits. And just to make things really interesting, this stacks with the two other sources in the book that have the same effect, so potentially the Haemonculus and any unit accompanying him could start with feel no pain and furious charge, gaining Fearless on turn 2. His stats are nothing to write home about, he won’t get a re-roll on his shooting, and his weapons skill is only one point above elite infantry models. He is however the only model that can take the crucible of malediction, which is stage 1 of the Dark Eldar’s psychic defence. It basically causes a nasty strength hit on any psykers or units with psykers in them within a random range roll. The downside is that the way the rule is drafted, if a psyker has joined a unit, the hit doesn’t necessarily hit the psyker. Hopefully this will be changed with an FAQ as at the moment it’s fairly useless for its intended purpose. In terms of wargear, he starts with two combat weapons and a pistol, and has a plentiful selection of upgrades. There are a variety of combat weapons and upgrade guns (which I’ll speak about in the Elites analysis). He can also take any of the artefacts available, some of which I’ve touched upon earlier. I’ll deal with the remainder here. First up is the Animus Vitae. It’s basically a one use only grenade. If it goes off, you’re laughing, because this is one of the other sources of boosting power from pain I mentioned earlier, and it boosts every unit in the army with the power from pain rule. However, against a typical marine equivalent, you’ve got a 50/50 chance of it causing the wound it needs to (not counting cover saves – don’t throw it at a unit in cover!) and it doesn’t have a blast template, it’s a one shot, one hit kinda deal. Second we have the Archangel of Pain. Again it’s a one use only item, only this time it forces all units within a set distance to take a leadership test with a negative modifier, causing wounds that ignore armour and cover for each point the test is failed by. Oh yeah, and it doesn’t work against fearless units or those with ‘And They Shall Know No Fear’. It’s worth noting here that the zealot rule no longer confers fearless, it just states that certain types of leadership tests are automatically passed. Finally, the helm of spite. This is possibly my favourite of the anti-psyker tricks available to the Dark Eldar (not counting any future FAQ to the crucible of malediction). It grants adamantium will to all units within a set distance (honestly for a race who’s fluff sets out that they’re psychically gifted but deny that ability through the power of their minds, I’m surprised they didn’t all have adamantium will from the start) Massively important though is that within that set distance, enemy psykers suffer a perils attack on any double. 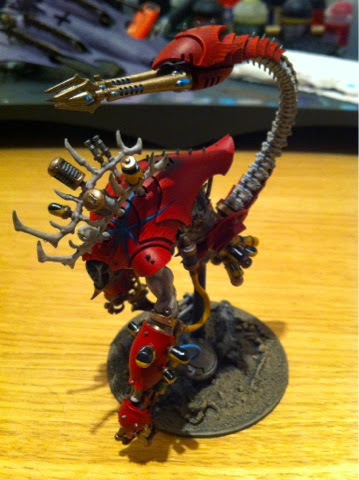 The Haemonculus is a bit tougher than most Dark Eldar, but he’s certainly not the kind of warlord who leads from the front (I imagine him more leading from behind a big pack of grotesques). What he will do however is make things just that bit easier for everyone around him. He’s not a slouch in combat, and some of the weapons he can take for those occasions are brilliant (he’s now one of the few models that can take the previously common venom blade) but don’t expect him to do anything there other than bully non-combat characters and units. 2. Make things difficult for enemy psykers. Similarly to the Succubus, I think that actually he’s better off accompanying non-coven units in the game, because the benefit he gives to those units from the power from pain table is nullified by them since all the coven units bar scourges start with Feel no Pain on turn 1. So there you have it, part 1 of my in-depth codex review. Next up I’ll look at the troops section with their dedicated transports. As always, feel free to post comments at the bottom of the page, I’m always interested to see other people’s take on things, and learn about things I may not have spotted. 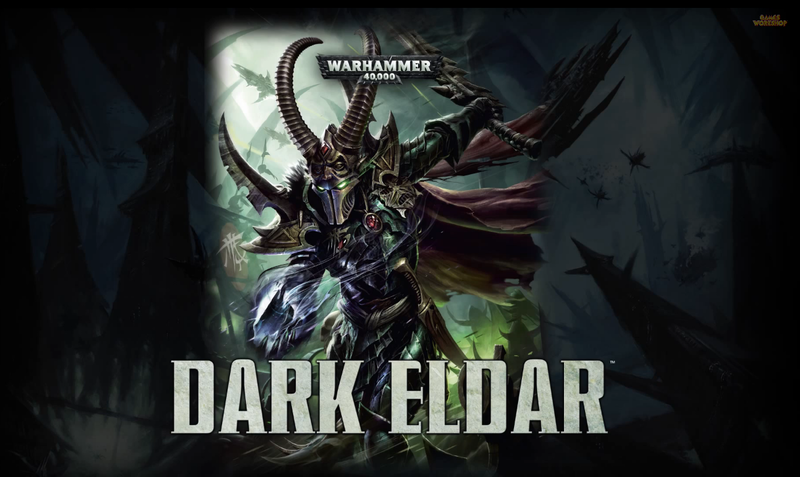 Today I’m going to be looking at the rumours for the new Dark Eldar codex, and using them to look at putting together a cohesive strategy for the Dark Eldar going forward – I’ve read much in the last few days from naysayers and pessimists that the codex is nerfing the Dark Kin hard, and taking away all the ‘flavour’ from the codex, so I’m going to put forward what I see as the optimistic, constructive point of view. Morning all, time to update you all on my painting progress once more, and this week has certainly been an eclectic one! 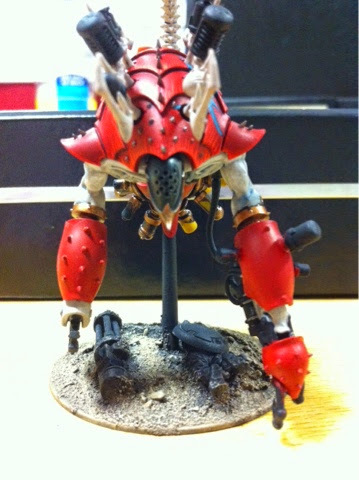 With all the dark eldar rumours fizzing around the internet I've decided to unbox the Kabal of the Burning Eye too, with a view to using them on the tabletop once more. My codex is on order and so my raiders need some attention! I decided that with a new edition I needed a new colour scheme or them, and whilst I was happy with the style, I'm changing up the spot colour (which should also mean the finished models will be fairly quick to update). Here are some pictures of my painting station at the moment! This was on Friday, below are some detailed pics of my progress since then. Hopefully there'll be plenty of progress this week and I'll have some finished models to show you next Monday! There's no way I could let this weekend go by without making some comment on all the dark eldar rumours that are doing the rounds. I didn't manage to play them in fifth, and after a 12 year break from gaming it's fair to say that my games were not hugely successful under the sixth ruleset. I parked them on a shelf in my garage while I concentrated on bringing the iron fists up to standard, both in terms of selection and painting standard. They're nearly there though now so this week I broke out the Kabal of the Burning Eye and began re-touching their appearance. I have to say that one of the main reasons I shelved the DE was the difficulty I had getting my units anywhere near their threat range (combination of tau players and lack of experience on my part). In no particular order here are the rumours I'm really pleased to see, in the hopes of making my beloved Kabal a force to be reckoned with. -deep strike for raiders and venoms. My raiders rarely ever survived to get in range or the splinter rifles on them to do any damage, and when they exploded they frequently took most of the squad with them. I took to using the duke to let me deep strike them, but the fact that sixth meant they could only snap shoot the turn they arrived really hurt. -court changing to remove minimum numbers of models, and medusa eye burst being S4 AP3 template. I can certainly see a real use for the court now, DE really suffered for not having many reliable template weapons but now the court can really deal with hordes. -detachment allowing 6 fast attack choices. Particularly if there is a points drop, I can really see me using this as my basic detachment, especially if the razor wing becomes FA too! - mandrakes having baleblast from turn 1. They were unusable previously, I got lucky once and took down a tau hq, but the models deserve more, and this should make the viable, even if they don't get a decent combat weapon. I'm disappointed there doesn't seem to have been an option to help wyches into combat (that we've seen so far), but if they can take their invun against overwatch that's all I could ask for. I've pre-ordered my codex so I'll be poring over it and writing a series of review posts just as soon as it's in my hands! Adeptus Astartes, Battlefleet Gothic, Black Flame, Black Library, the Black Library logo, BL Publishing, Blood Angels, Bloodquest, Blood Bowl, the Blood Bowl logo, The Blood Bowl Spike Device, Cadian, Catachan, the Chaos device, Cityfight, the Chaos logo, Citadel, Citadel Device, City of the Damned, Codex, Daemonhunters, Dark Angels, Dark Eldar, Dark Future, the Double-Headed/Imperial Eagle device, 'Eavy Metal, Eldar, Eldar symbol devices, Epic, Eye of Terror, Fanatic, the Fanatic logo, the Fanatic II logo, Fire Warrior, Forge World, Games Workshop, Games Workshop logo, Genestealer, Golden Demon, Gorkamorka, Great Unclean One, the Hammer of Sigmar logo, Horned Rat logo, Inferno, Inquisitor, the Inquisitor logo, the Inquisitor device, Inquisitor:Conspiracies, Keeper of Secrets, Khemri, Khorne, Kroot, Lord of Change, Marauder, Mordheim, the Mordheim logo, Necromunda, Necromunda stencil logo, Necromunda Plate logo, Necron, Nurgle, Ork, Ork skull devices, Sisters of Battle, Skaven, the Skaven symbol devices, Slaanesh, Space Hulk, Space Marine, Space Marine chapters, Space Marine chapter logos, Talisman, Tau, the Tau caste designations, Tomb Kings, Trio of Warriors, Twin Tailed Comet Logo, Tyranid, Tyrannid, Tzeentch, Ultramarines, Warhammer, Warhammer Historical, Warhammer Online, Warhammer 40k Device, Warhammer World logo, Warmaster, White Dwarf, the White Dwarf logo, and all associated marks, names, races, race insignia, characters, vehicles, locations, units, illustrations and images from the Blood Bowl game, the Warhammer world, the Talisaman world, and the Warhammer 40,000 universe are either ®, TM and/or © Copyright Games Workshop Ltd 2000-2013, variably registered in the UK and other countries around the world. Used without permission. No challenge to their status intended. All Rights Reserved to their respective owners.